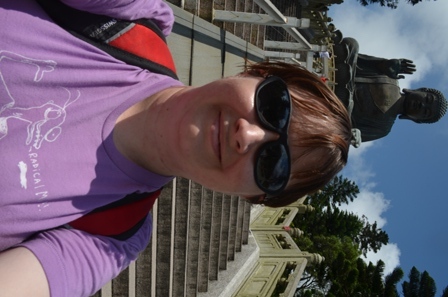 My day trip for my Hong Kong trip was a visit to Lantau Island. 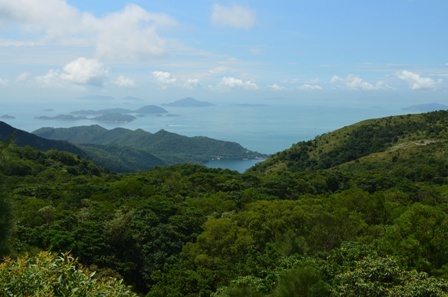 That island is the biggest in the Hong Kong archipelago, though it is sparsely populated. It is home to the international airport and Disneyland Hong Kong (subject of another post). But the rest of the island is filled with thick forests, small mountains and fishing villages. 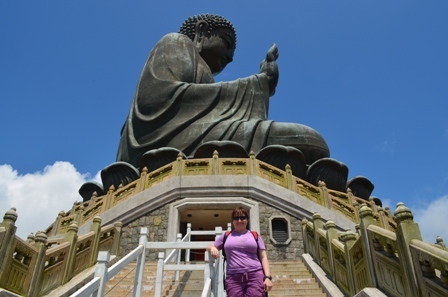 For the first half of my day trip, I decided to visit the Lantau Big Buddha (or its proper name, the Tian Tan Buddha) and the Po Lin Monastery. It is rather easy to visit both, since they are co-located in the same place. I had intended to ride the Ngong Ping Cable Car to get there. It starts right next to the Tung Chung MTR stop (the last stop on the orange Tung Chung Line. It takes about 45 minutes to reach from Hong Kong Station) and the 25 minute trip will take you straight to Ngong Ping village and provides unparalleled views of Lantau Island (I assume). However, the day I got there, I saw the sign that stated that the annual three weeks of maintenance on the cable car started that day. I was bummed, but there is always a bus (#23) that travels from the MTR stop to Ngong Ping village. It leaves approximately every 30 minutes, though in reality it will leave early if the bus is already filled to capacity with passengers. So while I didn’t get the aerial view of Lantau Island, I got a mini bus tour as the circuitous route wended its way through some fishing village before making the steep ascent to Ngong Ping village. 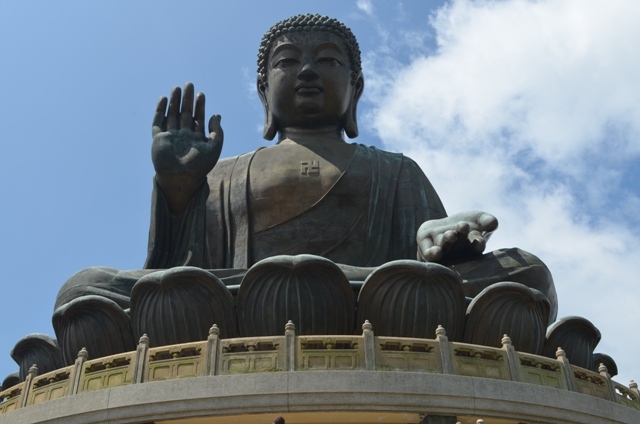 The Big Buddha has only been there since 1993, and until 2007, it was the tallest outdoor seated bronze statue of Buddha. 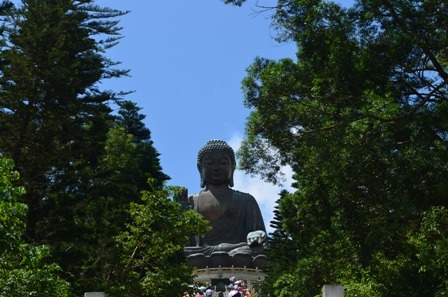 The Buddha is over 100 feet tall, and in fact can be easily viewed from below on the bus ride as you make your approach. 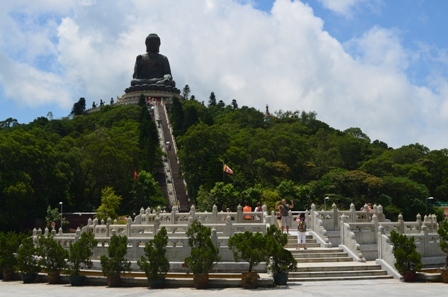 The Buddha itself is right next to the Po Lin Monastery. As you are in the square, you can easily see the Big Buddha towering over the square. Then you get to the bottom of the stairs. 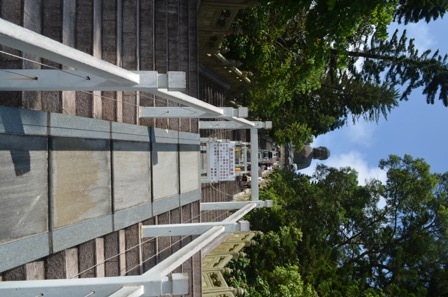 It is 268 steps to the top and the view from the bottom looking up at the Big Buddha is beckoning you, or taunting you, depending on your views of things. When I saw the stairs, I was reminded of the old Nike commercial from 1993 where a couple rapidly runs up the stairs of the Jaguar Temple in the Mayan ruins of Tikal. While I wish I can say I sprinted to the top, I did fairly well for the first 75% of the stairs before I started to feel the stairs, and more importantly, that wicked subtropical sun. This morning was the best weather of my trip, and the sun was high, bright and hot as it was pounding down on my head. And I stupidly forgot to bring my hat with me that day (at least I remembered the sunscreen and sunglasses). Once you are at the top, you can walk around the Buddha. 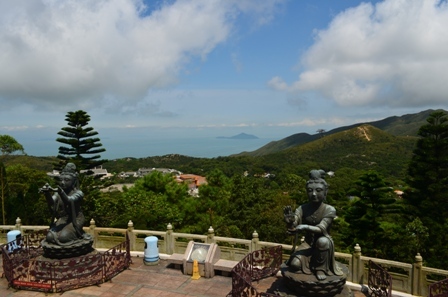 There are numerous smaller statues surrounding the Big Buddha, and there are some very nice views of Lantau Island. Some of those views reminded me of forest views of Kauai with the hills and thick greenery. The descent is not as strenuous as the ascent. I was hoping to see more of Po Lin Monastery, but the vast majority of it was under renovation. You can still walk through the gate and the open square, but the monastery itself was until piles of scaffolding. While there wasn’t currently much to see at Po Lin Monastery, and there was no sign saying when the renovation would be complete, make sure you stop in the dining hall for lunch. Between 1130 and 1630 every day, you can purchase a vegetarian lunch on the premises. Tickets are available either right next to the dining hall, or at the bottom of the stairs to the Big Buddha. HK $80 will get you a standard lunch outside, but for a mere HK $118 (less than $15 USD) gets you the deluxe meal. That meal is inside in the dining room and you are given a fabulous, delicious vegetarian spread. 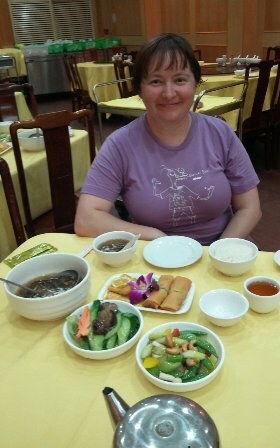 When I was there, I had this thick, tasty mushroom soup, vegetarian spring rolls, sauteed greens and mushrooms, stir fried vegetables and rice. If you choose to bring your own lunch, you can sit outside and enjoy it, though heed the signs that say that no meat or alcohol is allowed on the premises (Buddhists are vegetarians). There are other things to see and do up there. There are some other Buddhist hermitages you can walk to. If you wanted, you could climb up to the top of Lantau Peak, a walk that supposedly takes around three hours round trip. 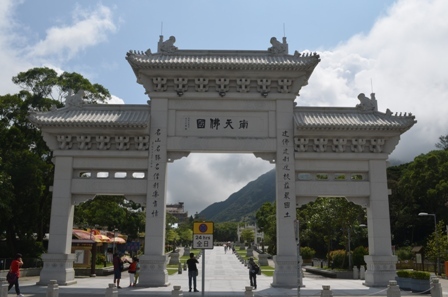 You can explore the Ngong Ping village. But for the most part, you can see the main sights in half a day. 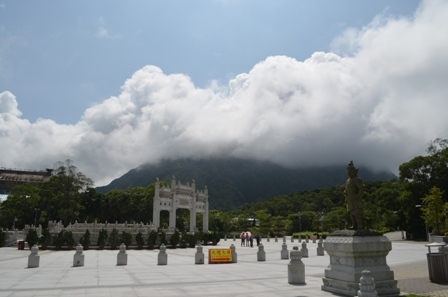 I would have taken more time there, but I had other plans for my Lantau Island day trip (covered in the next couple of posts). This entry was posted in Food, Travel and tagged Big Buddha, Hong Kong, Lantau Island, lunch, Ngong Ping, Po Lin Monastery, Tian Tan Buddha.